Former model Marion Finlayson, an 80 year-old Scottish grandmother, has been snapped up by top Glasgow modelling agency Colours, after catching the eye of scouts when she graced the catwalk after a 60-year break. Marion Finlayson made her modelling debut back in the 1940s, and decided to tread the runway once again at a charity event in her hometown Aberdeen as a way of distracting herself from her husband Bruce’s death. Marion Finlayson, who is grandmother to Antonia, 13, and Andrew, 11, said: “It’s all go at the moment. I’ve never been busier since appearing on the catwalk last year. ‘I actually got offers from two modelling agencies hundreds of miles away in Glasgow. 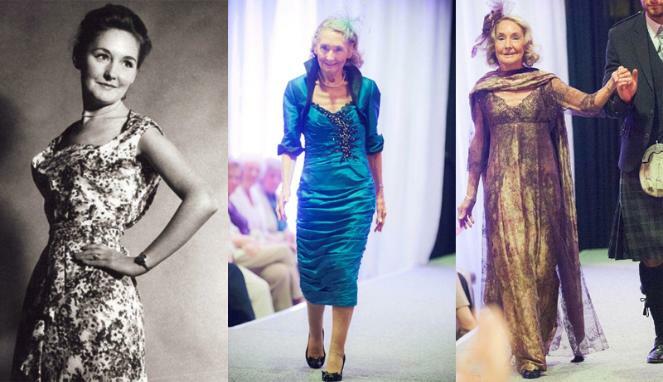 Marion Finlayson made her catwalk comeback at Aberdeen City Council’s 50 Plus Festival in August, a staggering 60 years after her fashion debut. Back in the 1940s she gave up her modelling commitments to become a teacher, but decided to take part in the fashion show in Aberdeen as a distraction from the death of husband Bruce Finlayson, to whom she was married for 54 years. Marion Finlayson says she likes to keep active, and regularly attends yoga and Pilates classes. Marion Finlayson recently wowed millions of viewers as she appeared on ITV’s This Morning show with Eamonn Holmes. Marion Finlayson joked about other people her age: “They’re often talking about their pills and their blood pressure, but I don’t have any of that yet, I’m as well as I’ve ever been. Rosalynd Ramage, who runs Colours Modelling Agency, said: “The world is Marion’s oyster.